The National Police Board went to court on Tuesday in the first stage of a bid to ban the neo-Nazi Nordic Resistance Movement. If the organisation is outlawed, its right to hold demonstrations will be curtailed and even disseminating materials will become a crime. The neo-Nazi Nordic Resistance Movement (Finnish acronym PVL) could be banned in legal proceedings initiated by the National Police Board at the Pirkanmaa District Court on Tuesday. Finnish law enforcement say the organisation should be shut down as violent and racist, and as such undeserving of legal protection. 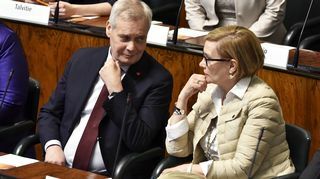 "Violent and openly racist organisations' operations should not enjoy the protection of Finnish society," said National Police Commissioner Seppo Kolehmainen in a statement. Registered associations in Finland must abide by the laws of the land and ascribe to 'good practices'. Although the Nordic Resistance Movement is not an officially registered association, the police board views it as an ideologically driven, unregistered association. Police say that the group cannot avoid the laws on associations simply by failing to register. In its submissions to the court the Police Board says that the organisation's material contains content that contravenes the 'good practices' clause and stigmatises groups and individuals, as well as material that advocates using violence to change the laws of the land. The organisation itself opposes the police suit and is demanding its legal costs are paid. The movement says in submissions to the court that its leading figures have not been convicted of slander or ethnic agitation. The organisation also cites the right to freedom of association. Last year a member, Jesse Torniainen, was sentenced to two years in jail for an aggravated assault that allegedly led to a man's death at a Nordic Resistance Movement demonstration in Helsinki. That case has been appealed by the prosecutor, who was not satisfied with the sentence. If the organisation is banned, it will become illegal to raise funds or recruit members, or even to disseminate stickers and other propaganda material. According to some experts, it would also free police from the obligation to allow NRM demonstrations. "Planning to meet up as an association is then a punishable offence," said Lauri Tarasti, an expert on the law of association in December. "It's not permitted to continue any operations in the unregistered association's name. Dissolution of the organisation would prohibit even, for example, placing its stickers on a lamppost or maintaining the website." Finland previously banned national socialist organisations in the 1970s when several associations established by Nazi Pekka Siitoin were dissolved on the grounds that they opposed democracy, and were therefore in breach of the Paris Peace Treaties of 1947 that ended the Second World War. Initial statements were heard on Tuesday, with the main hearing due to take place in October.